Doudou N'Diaye Rose was a brilliant musician and a brilliant dresser as well, with a custom-made wardrobe of vivid, billowing outfits. Above, wearing Senegal's national colors, he sets the beat at a concert in Dakar on Dec. 10, 2010. Senegal is stunned and in mourning. The country's foremost traditional drummer, Doudou N'Diaye Coumba Rose, died at age 85 on Aug. 19. They called him the "mathematician of rhythm" and he brought local drumbeats to a global audience. I first set eyes on this musical genius a quarter-century ago in Ouagadougou, the capital of Burkina Faso, where he was the star performer at the opening of the biennial pan-African film festival, FESPACO. A slight, pixieish musician with a piercing gaze, N'Diaye Rose was a one-man dynamo. He dressed in billowing, vividly colored costumes, custom-made for his stage performances — voluminous tops cinched at the waist with sashes, and traditional wide-legged bottoms called sahwel. The outfits came in brilliant orange satin, mixed with bold African cotton prints or deep indigo blues. He danced the drum, beating complex, tattoos on his sabar — the tall, wooden, Senegalese drum, with a sheep- or cow skin stretched over the top. The drum is generally played loud — striking alternately with a stick and a bare hand, exaggerating the pulse of the rhythms. It's called the talking drum, and no one could make it talk like N'Diaye Rose. He had extraordinary energy and vigor well into his 80s, darting from one end of the stage to the other, leaping in the air, dancing, waving his hands, conducting and pointing his drumstick, before pouncing on his sabar and beating it to perfection. He was also quick to smile and to help others. In 2006, UNESCO named him a "living human treasure" for his contribution to the cultural heritage of Senegal and for passing his art and knowledge onto younger generations. So it's a good thing he didn't listen to his dad! N'Diaye Rose told journalists he fell in love with the sabar at the age of 9 and never looked back. For a while, he reportedly fell out with his accountant father, who wanted him to become a professional man and warned him against a career in music. He briefly worked as a plumber, we're told, but his passion — percussion — was to become his life. 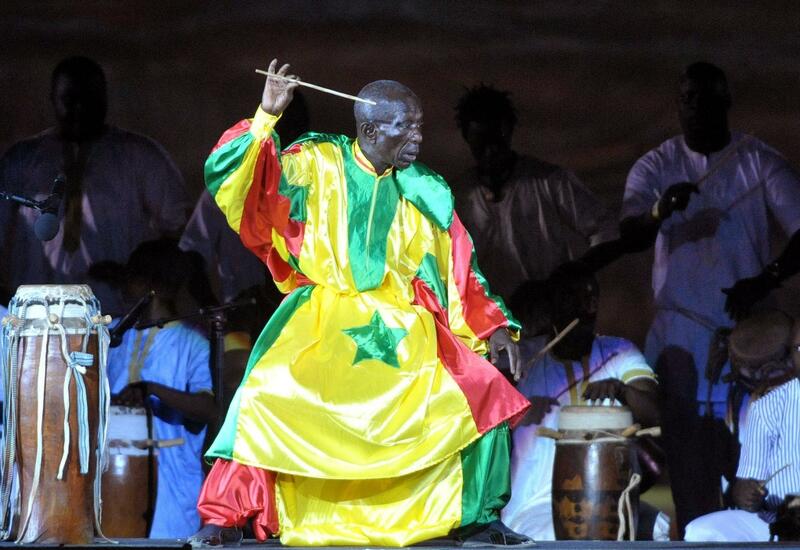 N'Diaye Rose said his mentor and teacher was an earlier Senegalese drum major, Mada Seck. He often said Seck knew all the secrets of percussion and passed his knowledge, his instruments and his charms to N'Diaye Rose. He traveled all over Senegal to learn the lyrical language of the drum and, as he put it, "more than a hundred different rhythms." It was only then, he said, that the elders appointed him the new chief drum-major. During his lifetime, he added significantly to the vibrant vocabulary and rhythms of the sabar and the many other traditional drums he played. N'Diaye Rose often recalled this early period of his life, when he learned that the tapping of the drums was a surefire method of communication between villages. Drums were played at marriages, baptisms, naming and circumcision ceremonies and other social gatherings. In 2010, he told the French News Agency AFP he had "never wanted to play blindly! I met the elders so that they could teach me the very precise language of the drums that everybody recognized then." He said it was important to know "how to announce a bush fire; that a snake has bitten someone and what kind of snake; that a woman who has just got married has gone to the conjugal home and that the husband is happy with her." While steeped in Senegalese tradition, N'Diaye Rose collaborated with musicians at home and abroad. Dizzy Gillespie, Miles Davis, the Rolling Stones and Peter Gabriel were among his partners onstage. He savored telling how the legendary singer and dancer Josephine Baker invited him, when he was just 19, to perform with her in Senegal shortly before the country's independence in 1960. N'Diaye Rose's U.S. debut was in 1998, with a 30-member ensemble in New York, again featuring frenetic drumming and dancing. He also shared the bill with younger Senegalese musicians, motivating them to reach for the skies. Grammy award-winning singer Youssou N'Dour told Reuters the death of N'Diaye Rose "is one of the greatest losses to our country in terms of music and rhythms." N'Dour said "he always encouraged me and gave me a chance." Rapper Didier Awadi, 46, described N'Diaye Rose as a generous mentor and friend, "at ease playing with both modern acts and traditional groups." "He was a genius, who was able to turn the sound of many drums into a symphony," Awadi told the BBC. Awadi said every bit of music N'Diaye Rose played held a message, because he understood the language of the drum, which the rapper described as Africa's "first cellphone" for communication. N'Diaye Rose performed right up until his death. He was honored with a special musical ceremony in Dakar last month, to mark his 85th birthday, barely two weeks before he died after a short illness. While no one can match him, he leaves many disciples. A composer and conductor, he led the Drummers of West Africa orchestra, made up mostly of the many children and grandchildren he taught. N'Diaye Rose's daughters and granddaughters made up an all-female lineup called Les Rosettes. He raised two generations of percussionists within his own family, leaving behind a dynasty of drummers.